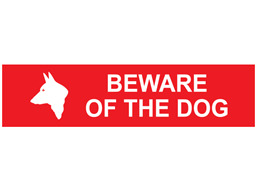 Home > Signs & Signage > Traffic Control Management > Parking Signs > Beware of the dog, mini safety sign. Beware of the dog, mini safety sign. Guard dog symbol safety sign. Beware of the dog. Part of our mini safety sign range, to create awareness to workers, visitors or the general public that a dog is on the premises. Mini safety signs. Beware of the dog. Small format. Signs comply with ISO 1710, and the Safety Signs and Signals Regulations 1996. MIGS5251 Size 50mm x 200mm. Material semi-rigid plastic with adhesive backing.